A few years ago, a couple inmates broke out of a prison in upstate New York. Since I live many miles and hours away in New York City, I was intrigued by the story but it never affected my daily existence. I was never afraid of being attacked by those inmates, I didn’t hear every detail about the investigation into how it happened or the urgent search, and it didn’t change how I viewed law enforcement or convicted criminals — and I never thought about what life must be like for the people living in the area where they escaped. 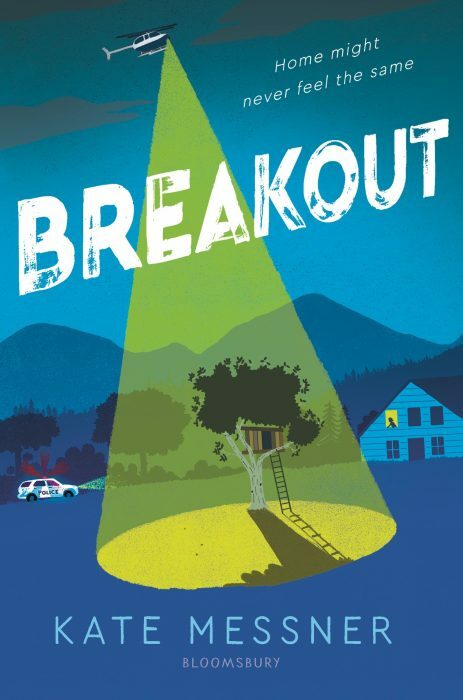 In Breakout by Kate Messner, I got a window into what those folks might have experienced. Although it’s fiction, the story in Breakout has obvious parallels to the real story: Two inmates somehow escape from a facility in upstate New York, and they manage to hide from authorities even as a serious manhunt ensues. For Nora, it’s an exciting opportunity to hone her skills as an aspiring journalist — but also a challenging time for her family, as her father is the superintendent of the prison and faces a lot of pressure. For her best friend, Lizzie, it’s a chance to write some truly hilarious satirical articles for Nora’s records — until her own family unexpectedly gets caught up in the story. And for new girl in town, Elidee, it’s a a frustrating blocker to visiting her brother, who is in the same prison. It’s also a time when all three characters learn a lot about themselves, and when Nora and Lizzie start to see some hard truths about their neighbors and the world at large. I recommend this book for fans of stories that are about everyday school/family life and simultaneously about societal issues (like Ghost by Jason Reynolds) — and also for fans of Jacqueline Woodson’s books, because in Breakout, Elidee reads Brown Girl Dreaming and writes her own poetry inspired by it! If you were going to write a book inspired by a real-life news story, which event would you choose? Leave a comment with your answer! Karen also enjoyed the references to Hamilton in this book and was inspired to listen to the Broadway cast recording for roughly the millionth time!